Canon video cameras have the innovation you need and the reliability you love in delivering superior video and image quality and performance. Canon’s ranges of professional video camcorders are made for demanding creative videographers, it provides creative control, flexibility, and capability, in both High Definition and Standard Definition formats including Canon Vixia AVCHD, Canon XF MXF, Canon FS MOD or Canon EOS MOV, etc. If you have lots of video recorded by your Canon camera or camcorder, you may have problem to play canon videos in your mobile or other portable media player or can not import to editing software. So UFUShare will help you to handle all kinds of video formats incompatibility issues between Canon series footages and target programs. This article covers tips and tricks on the Canon Vixia AVCHD, Canon XF MXF, Canon FS MOD or Canon EOS MOV, etc video playback with media players or editing in FCP X, Final Cut Pro, FCE, Avid Media Composer, Adobe Premiere Pro, Sony Vegas, Windows Movie Maker, etc. We can record different video format and resolution via Canon cameras or camcorders. Usually you can get .mxf, .mp4, .mov, .mts files. UFUShare recommended a Canon Video Converter for Windows or Mac, which is an all-in-one video converter program that supports transcoding Canon 4K/1080p/720p, MXF, MOV, MP4, MTS footage to any video formats for playing, editing, uploading or burning. The Canon Video Converter can convert any recordings from Canon cameras and camcorders. 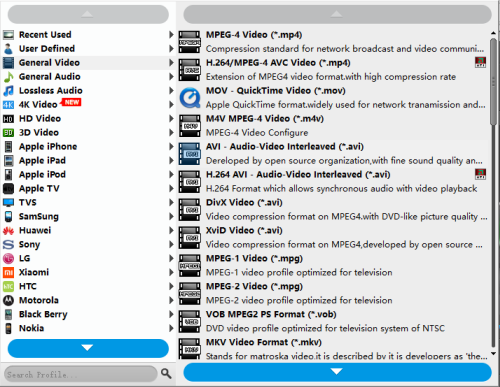 Moreover, it’s capable of outputting videos in Apple ProRes, AIC, DNxHD, DVCPRO, etc. for NLEs like Final Cut Pro, iMovie, FCP, FCE, Avid Studio, Adobe Premiere Pro, Apple Aperture 3, Kdenlive, Keynote, Avid Xpress Pro, Adobe Creative Suite 6, Adobe After Effects CS6, DaVinci Resolve, iPhoto as well as QuickTime MOV for playback. How to Convert Canon Videos to Compatible Format for Playing or Editing on Windows/Mac? 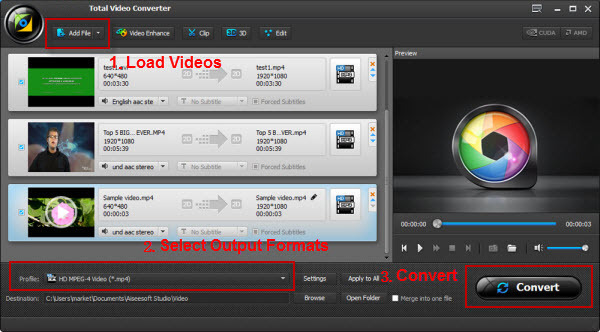 Run Canon Video Converter on your Mac or Windows, then drag the Canon Vixia AVCHD, Canon XF MXF, Canon FS MOD or Canon EOS MOV, etc videos to this program directly. For playing Canon footage freely, you need to convert Canon video like .mxf, .mp4, .mov, or .mts files to a common video format, such as H.264. Almost all the devices or players are supported this format playback. This software supports a lot of options for editing software. Take Premiere Pro CC as an example, just clicking “Format” then choose “Editing Software” > “Adobe Premiere/Sony Vegas AVC MOV (*.mov)” as output format. Hit the “Convert” button under the preview button and this Canon Video Converter will start Canon Vixia AVCHD, Canon XF MXF, Canon FS MOD or Canon EOS MOV, etc videos conversion immediately. How to Recover Deleted MXF/MTS/M2TS/MOV/MP4/AVI Video Files?